"I Am Spike, Hear Me Roar" by Chelsea Fedigan. 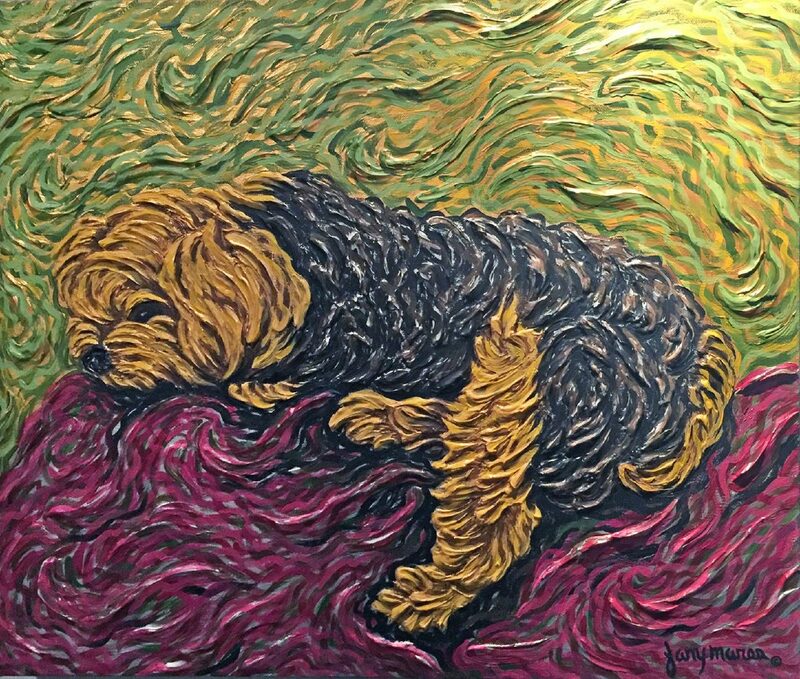 On display at Hinovations Art Gallery, “Pet Portraits in Art” is an exhibition with a warm and fuzzy feeling. This group show features paintings and drawings by 17 artists who have created images of their non-human friends. Mostly suggesting human selfie tendencies with a focus on the face, a few works rise above this point of view, while others surrender to a charming sweetness about their subject. Celerino Castillo’s “Choloawa” is the best of the latter mentioned. 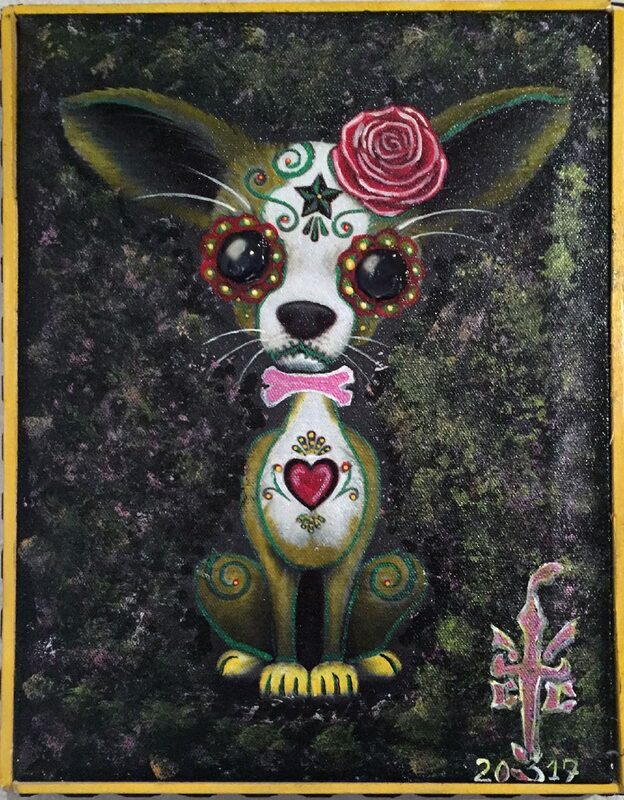 Sporting a jaunty rose and whimsical sunglasses, this confident and treasured Chicana dog looks directly at the viewer, communicating a tough sweetness. The most complex work in this exhibition is “Boxer” by Lupe Hernandez. Strongly influenced by Cubism, Hernandez combines Cubist conceits with his youthful experiments with graffiti, then adds realistic portraiture to the mix. What skillfully results is a well navigated compositional foray merging an acknowledgment of the flat picture plane with well-drawn illusionism. "Train to Times Square" by Raquel Hinojosa. "Wind and Wuthering: Tales of an English Hunter" by Marco Sanchez. 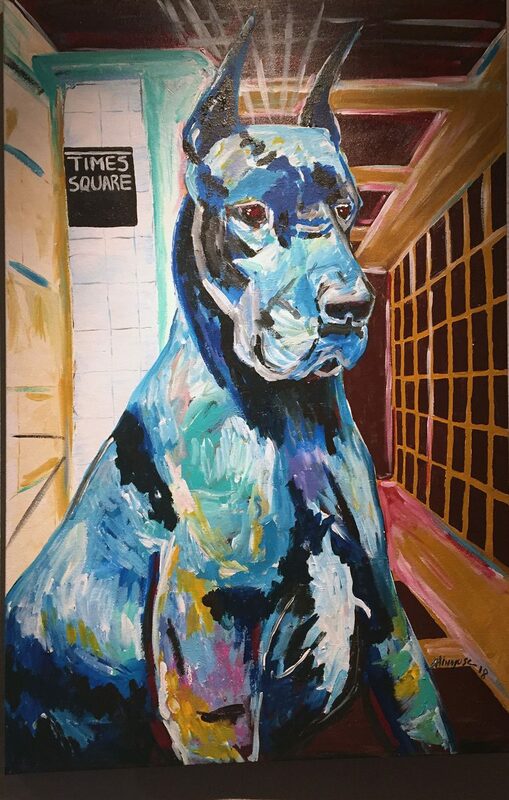 Chelsea Fedigan and Fany Mares also successfully combine the image of the animal with their artistic direction. “I Am Spike, Hear Me Roar” by Fedigan, brings together the artist’s control of color. The assertive dog’s face is shown at close range, but we don’t feel threatened. Although Spike has taken command of his bright yellow color field, his face fills only half of the canvas. His spikey hair is carefully outlined in orange, surrounding a blue and purple-hued black coat and popping with a bright pink tongue. The dark image against the yellow background screams urgency, but not quite of a deadly sort. By contrast, Mare’s embeds the image of “Browny” into her signature boldly textured surface, communicating a strong sense of tactile relationship. “Browny” appears passive in being depicted lying down with one eye partially open. Post Impressionistic paint strokes reinforce the feeling of ongoing vigilance. Even though these images reflect the present, there are some affectionate references to the past, not only evident through usage of appropriate past artistic styles, but sometimes outspokenly as part of the artwork itself. Marco Sanchez romanticizes the pre-World War I era that was popularized in the Downton Abbey series. 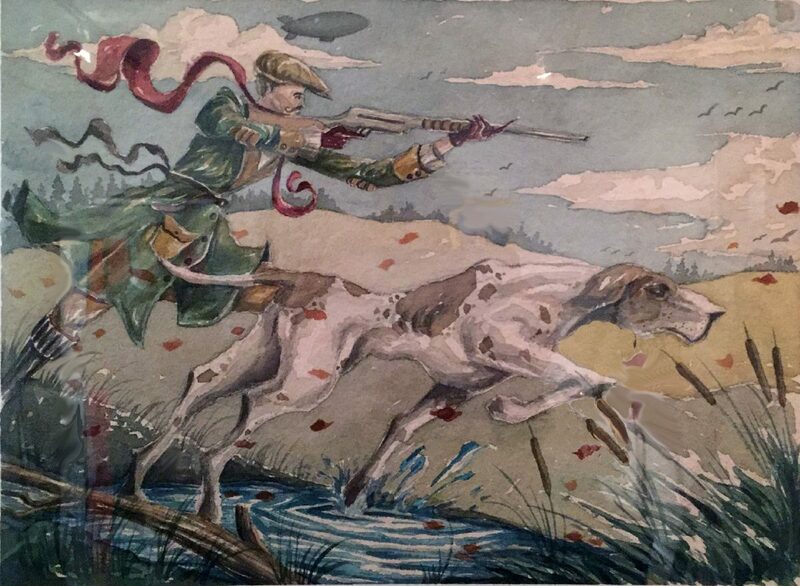 His watercolor, “Wind and Wuthering: Tales of an English Hunter,” dives headfirst into nostalgia by portraying a birding dog with its aristocratic owner. Sanchez also connects with the final gasp of a tradition that peaked during 18th and 19th century Europe, where — in great detail — pets were commonly included in family portraits. These images usually included the pet’s environment or relationship to their owner. Unfortunately, many works in this show lack the effort to tell us anything about the isolated pet other than the fact that its head exists. 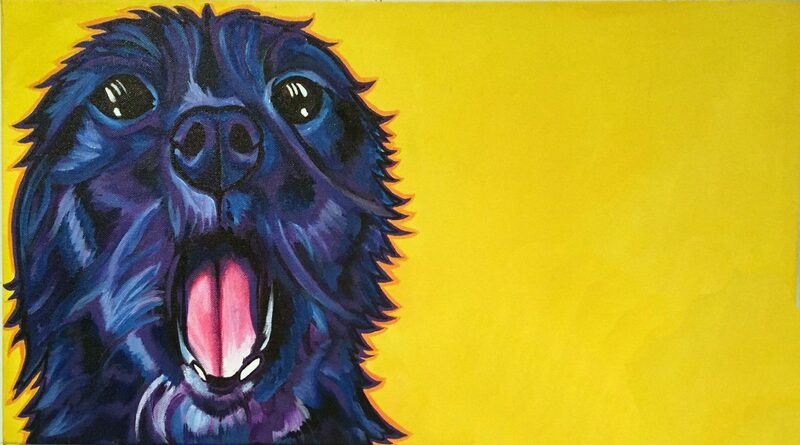 “Pet Portraits” is partnering with the Laurie P. Andrews PAWS Center in Edinburg. Proceeds from the sale of the artwork will go to the center. Hours: 1 to 6 p.m. Monday to Thursday; 10 a.m. to 5 p.m. Saturday or by appointment.